Mary E. Culpeper, Dau, F, Wh, 3 9/12, sng, MS/MS/MS. Mary E. Culpepper, Sister-in-law, F, Wh, 59, Md2-10 yrs, ch 2/2, MS/AL/AL. Obituary* 18 Nov 2009� Services for Sam C. Culpepper will be held Thursday at 11 a.m. at Bethany Baptist Church with Revs. Jimmie Garrard and Marvin Cooper officiating. Burial will be in the church cemetery with Barham Funeral Home in charge of arrangements. 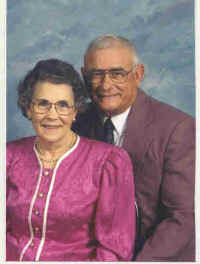 Mr. Culpepper, 78, of Meridian, died Tuesday, Nov. 17, 2009, at Rush Foundation Hospital. He was a member of Bethany Baptist Church and a veteran of the U.S. Army. Survivors include his wife, Almogene Tims Culpepper of Meridian; brother-in-law, Byron Tims and his wife, Vernell, of Walnut Hill, Fla; and several nieces and nephews. He was preceded in death by three sisters, Lottie Cook, Elizabeth Culpepper and Mildred McKinney; and one brother, Levin E. Culpepper Sr.
E-mail written Nov 2009 to Lew Griffin from Matthew Aaron Culpepper (#4284), e-mail address. Obituary of Sam C. Culpepper (#4146), published 18 Nov 2009. Photographed* say 2000� He was photographed say 2000 at Meridian, Lauderdale Co., Mississippi. Obituary* 5 Mar 2003� Services for Levin E. Culpepper Sr. will be held Thursday at 3 p.m. at Barham Funeral Home Chapel with the Rev. Dr. Malcolm Lewis officiating. Burial will be in Clay Memorial Cemetery in Cuba, Ala.
Mr. Culpepper, 77, of Meridian, died Tuesday, March 4, 2003, at Rush Foundation Hospital. He was a Baptist and was retired from SW&IB, which is affiliated with the U.S. Railway System. He was a veteran of the U.S. Navy and served in World War II on the LSM#4. He was a volunteer with the Lauderdale County Department of Archives and History for several years. Survivors include his wife, Elenor Shaw Culpepper of Meridian; a daughter, Dianne Culpepper Kelly of Thomaston, Ga; a son, Levin E. Culpepper Jr. and his wife, Lynn, of Cuba, Ala; a brother, Sam C. Culpepper and his wife, Almogene, of Whynot; two grandsons, Nathan Culpepper of Meridian and Matt Culpepper of Starkville; and several other relatives and friends. He was preceded in death by his parents, Sam and Hassie Culpepper. (Photograph Caption. Photo not available) PROUD MOMENT - Levin Culpepper Jr., left, talks with the Rev. Max Burris while Eleanor Reynolds hugs her friend Eleanor Culpepper, widow of the late Levin Culpepper Sr. " honored Wednesday for his longtime volunteer service at the Lauderdale County Department of Archives and History. Levin Culpepper was a history and genealogy buff, so his wife was not at all surprised when he began volunteering at the Lauderdale County Department of Archives and History. "He loved talking about history and World War II," Eleanor Culpepper said. "He really enjoyed it and he didn't do many things he didn't enjoy." Culpepper was a volunteer at the department, on the second floor of the Raymond P. Davis Courthouse Annex in downtown Meridian, for almost 20 years. "We have such fond memories of Mr. Culpepper," Ward Calhoun told an audience of family and friends Wednesday as he dedicated a research room at the department in Culpepper's honor. Calhoun is the department's records manager. "He was a fixture here," he said. "He was here when I came and I was glad of it. He was a tremendous amount of help." Culpepper died in March 2003 at the age of 77. He was a veteran of World War II and served in the U.S. Navy. He retired in 1986 from the Southern Weight and Investment Bureau and then began volunteering at the archives. Fellow volunteer Ed Shields described Culpepper as a man "full of life." "People like Levin are the people we have the most trouble being parted from," Shields said. "We thought he was going to live forever." Culpepper's children also spoke about their father on Wednesday. "We knew how he loved coming up here," Levin Culpepper Jr. said. Article by Penny Randall, Staff writer, November 11, 2004. Obituary* say 19 Sep 2016� Almogene was born on December 12, 1929 and passed away on Monday, September 19, 2016. Almogene was a resident of Meridian, Mississippi at the time of her passing. She was married to Sam. Ida Culpepper married J. H. Yarbrough on 15 Dec 1885 in Sumter Co., Alabama. Carol Smith's Genealogy Page, May 2000. + Rev. Ambrose Yarbrough, Feb. 19, 1772 - July 20, 1861 (Founded Liberty Baptist Church, May 31, 1845). + Ezel Eaves, Nov. 29, 1871 - Jan. 25, 1934. Clara L. (Price) Culpepper, Dau, F, Wh, 20, md, MS/MS/LA. Clyde M Culpepper Jr, Grand-Son, M, Wh, 4/12, Sng, MS/MS/MS. Blanks Culpepper, Son-in-law, M, Wh, 28, md@24, MS/AL/AL, Druggist, Drug Store.